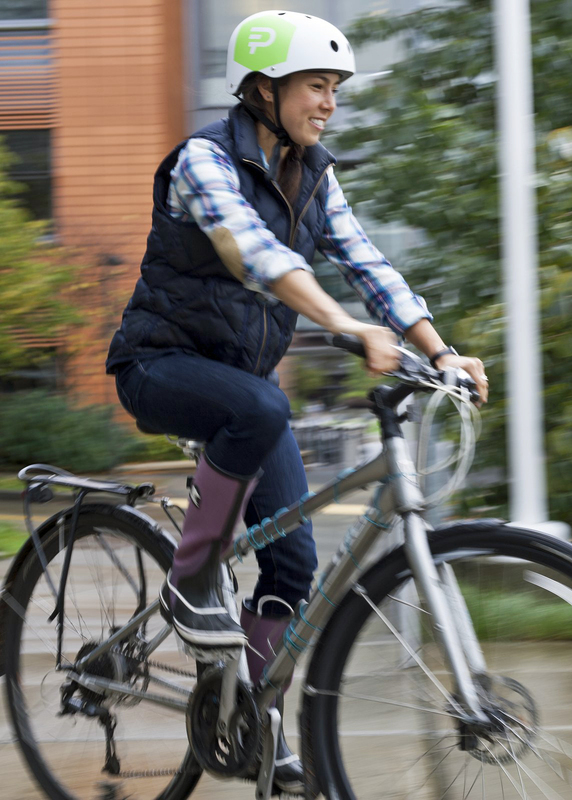 The University of Washington’s innovative “Ride in the Rain challenge” is among the reasons the university has just moved up to the highest gold level set by the League of American Bicyclists. Among the 100 current Bicycle Friendly Universities recognized by the league, only 10 have achieved gold. The league’s president and a panel of city and university experts talking about current progress and the path forward for bicycling around the region will kick off the annual November “Ride in the Rain” bike commute challenge this Thursday, Oct. 30. The kickoff event, which is open to the public, starts at 7 p.m. in Architecture Hall Auditorium. The “Ride in the Rain” challenge encourages year-round bicycle commuting with special November events, classes, prizes and friendly competition. Started in 2004 as an event for UW commuters, the challenge has grown to include staff at Seattle Children’s Hospital and is hosted for the first time this year by the Cascade Bicycle Club. The UW’s gold award also recognizes other campus initiatives to encourage cycling such as offering more than 1,500 high-security bicycle parking spaces – there are 5,700 bicycle parking spaces overall – and a free bicycle valet service at Husky home football games. With the recent launch of Pronto! Cycle Share, U-PASS holders get a $10 discount on annual Pronto membership. This allows them an unlimited number of rides between the seven Pronto stations on campus, as well as to stations downtown, in South Lake Union and on Capitol Hill. Rides are free to members for up to 30 minutes, and clean helmets can be borrowed at the stations. Speakers at the kickoff will be Andy Clarke, League of American Bicyclists president; Scott Kubly, Seattle Department of transportation director; Elizabeth Kiker, Cascade Bicycle Club executive director; Holly Houser , Pronto! Cycle Share executive director; and Nancy Rottle, UW faculty member and Green Futures Lab director. “This is a conversation that is happening at campuses and in communities across the U.S. and the University of Washington is proud to be taking the lead,” said Josh Kavanagh, UW Transportation Services director.